I was bored, Thanksgiving is around the corner, so what do I do? Try to play with some chocolate creations! I am very impatient and inexperience when it comes to playing with melted chocolate. When I found a packaged of large marshmallows in the pantry, I knew exactly what I wanted to make: Tigger Tails! Tigger Tails, available at Disneyland, are these marshmallows on a stick covered in orange chocolate, which makes them look like Tigger's (from Winnie-the-Pooh) tails! Ok, so I wanted to make Tigger Tails, but then I remember something else that was posted on the fantastic MouseWait Lounge and wanted to tried making something a bit more challenging so I attempted to make some Snowman Mickey on a stick! 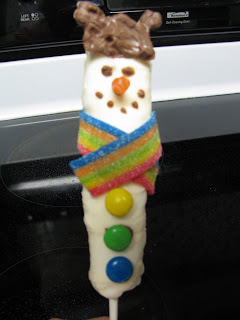 Snowman Mickeys are simple to make: I stacked four large marshmallow on a lollipop stick and covered it with melted white chocolate. Afterwards, I melted some milk chocolate and poorly attempted to create a lumpy pair of Mickey Ears (lesson learned here... make sure chocolate is super melted). I also attached colored M&Ms as buttons, rainbow sour belt as a scarf, part of an orange Sour Patch kid for the nose, and piped on chocolate eyes and mouth. Besides the awkward Mickey Ears, I think my Snowman Mickey looks pretty cool! Who wants it? I'm not a fan of sweets and I really don't like marshmallows so I need to hire someone to test my tasty treats for me! After making my Snowman Mickey, I had some leftover white chocolate so I decided to play around with some of my chocolate molds. 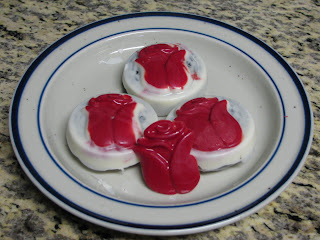 Here are some Oreo cookies covered in white chocolate! Sounds sweet huh?